The information on this website is dedicated only to medical professionals. CERAFORM® ceramics, manufactured by TEKNIMED and designed for filling bone defects, are made from tricalcium phosphate and hydroxyapatite. Tricalcium phosphate is a calcium phosphate with faster resorption kinetics than hydroxyapatite. The calcium phosphates used to make ceramics are manufactured and inspected by TEKNIMED and comply with standards ISO 13779-1, ASTM F1185 and ASTM F1088. 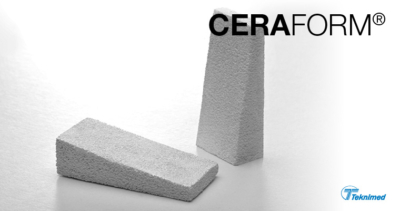 CERAFORM® ceramics, manufactured by TEKNIMED and designed for filling bone defects, are made from a biphasic mixture of hydroxyapatite and tricalcium phosphate. Tricalcium phosphate is a calcium phosphate with faster kinetics resorption than hydroxyapatite. 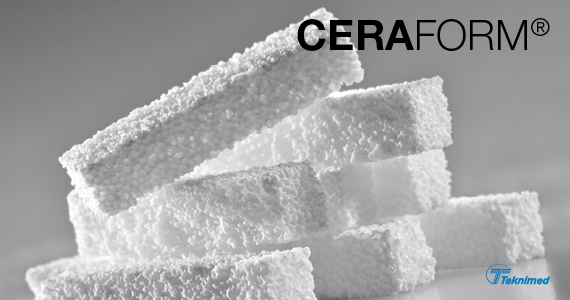 CERAFORM® is only used for bone filling associated with defects or voids that are not intrinsic to the stability of the bone structure. 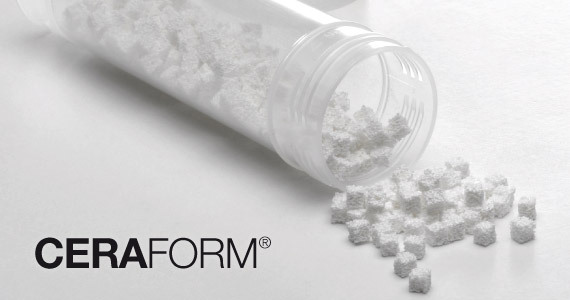 CERAFORM® is indicated in the treatment of bone defects or surgically-created traumas. CERAFORM® should not be used to treat large bone defects. CERAFORM® is designed to be placed in defects of the skeletal system. After being placed in bone defects, calcium phosphates are replaced by bone during the healing process. They are perfectly tolerated and therefore biocompatible. As opposed to bio-inert ceramics (alumina, zircon), they are bio-active and therefore have chemical exchanges with living tissues. After implantation, the material is the site of extracellular dissolution and cell-mediated degradation. These processes depend on the chemical (HAP, β-TCP, BCP) or physical (pores of the material) structure and the environment of the material. Biological fluids occupying the micropores are enriched in Ca, which finishes with the precipitation of apatite crystals similar to those in the neighbouring bone (process of calcification and not ossification). If the macropores are large enough, the process of osteoconduction may come into play, as well as subsequent Haversian bone remodelling. Calcium Phosphate ceramics are osteoconductive (but not osteoinductive), and require intimate contact with the receiving bone with no movement between bone and implant. Implant resorption should not be too rapid to allow the macropores to be colonised by mesenchymal cells at different stages of differentiation, which enables bone to be laid down. HAP is very insoluble and the in vivo degradation rate is very low but varies with pH. ß-TCP is much more soluble and is significantly degraded in vivo. Biphasic products have properties that vary with the ratio between HAP and ß-TCP. The clinical outcome therefore depends on colonisation and resorption kinetics, which are affected by the chemical and physico-chemical natures of the implant; these criteria must therefore be fully controlled. One of the disadvantages of macroporous calcium phosphate ceramics is their fragility and poor mechanical strength, which restricts their use in cases of high strength (they are even weaker in bending or torsion than in compression). Their applications are often associated with the use of osteosynthesis devices.